Product prices and availability are accurate as of 2019-04-15 15:29:42 EDT and are subject to change. Any price and availability information displayed on http://www.amazon.com/ at the time of purchase will apply to the purchase of this product. 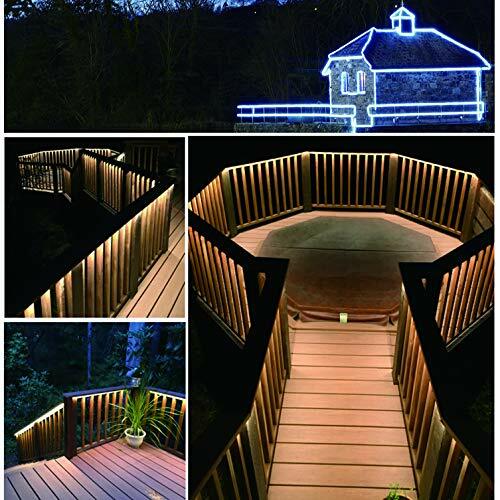 Areful strives on providing various, high-quality, indoor outdoor usage and commercial residential lighting. We cooperate with a manufactory which has a quite long production history of lighting fixture and is a preferred partner of various well-known companies worldwide. Areful makes your home and office full of light and makes your heart full of love, happiness, laughter and entertainment. 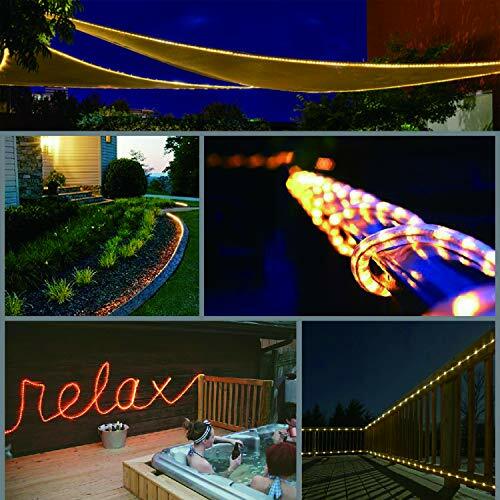 This 16.4ft flat flexible RGB LED light strip provides the perfect light for indoor and outdoor use and display lighting. You can aim the remote directly at the infrared sensor attached at the end of the cord on the RGB LED controller cord to modify settings. NOTE: Make sure there is nothing in the way between the remote control and the infrared sensor. Remote control can be sensitive and can manipulate rope lights correctly at a proper distance. This strip light is an extendable unit. NOTE: Link only up to four 16.4ft units together. Use only Areful LED-4W-8X4-16.4FT-EX-RGB strip light extension segments. Mounting screws are included. Insert them through the holes in the mounting clips. NOTE: Connect the rope lights together (for extension needs) and light them up before mounting them to check them. If there is something wrong, please don't to mount them and write to us for immediate help. The power adaptor should be protected for outdoor usage. TRANSFORM YOUR LOVING SPACE INTO A BEAUTIFUL AND ATTRACTIVE OBJECT. 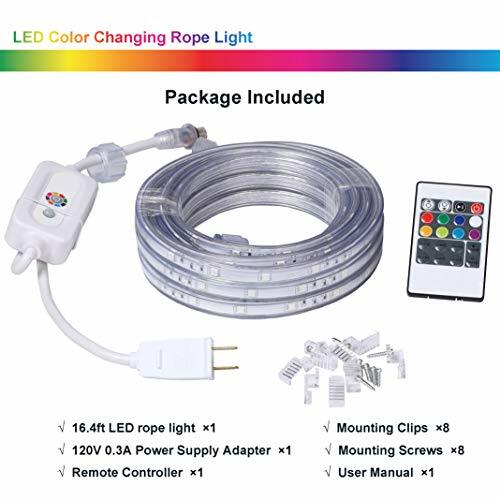 This LED RGB rope light has 8 static colors red, green, blue, white, orange, yellow, cyan and purple and multiple gorgeous lighting modes to meet your different décor needs. The changeable and dimmable colors create a festive or romantic mood, a cheerful feel or something else just depending on your settings, enhance the atmosphere of Christmas, Wedding, Cocktail Party, Birthday Party, BBQ, Bistro, Café, etc. BEST PICK FOR INDOOR AND OUTDOOR DÉCOR. These rope lights outdoor are connectable. They can be linked up to 4 strips together (65.6ft in total). 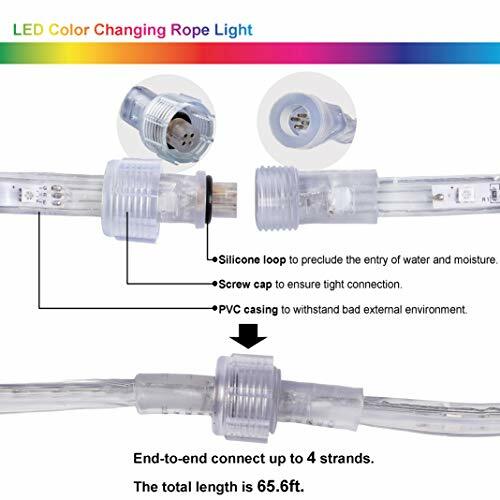 Thanks to the PVC casing design and the connector cover structure, this waterproof rope lights can withstand the splashing water, perfect for indoor and outdoor use. This light rope can better meet your decorative lightening needs for its flat and flexible features. EASY TO INSTALL AND USE. 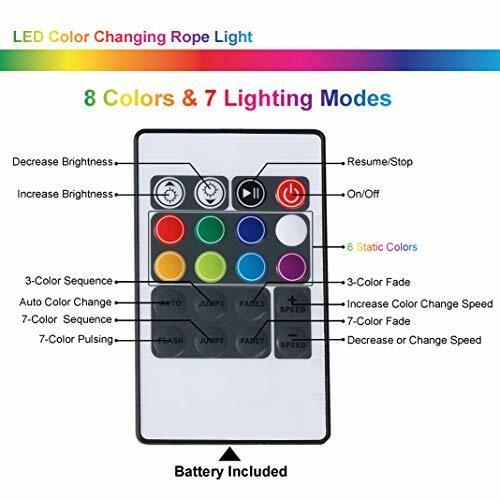 The LED rope lights is remote controlled. You can easily turn on/off and modify settings at a proper distance from it. Mounting hardware are included. The clips are crystal clear and seem invisible when the LED strip lights is working. 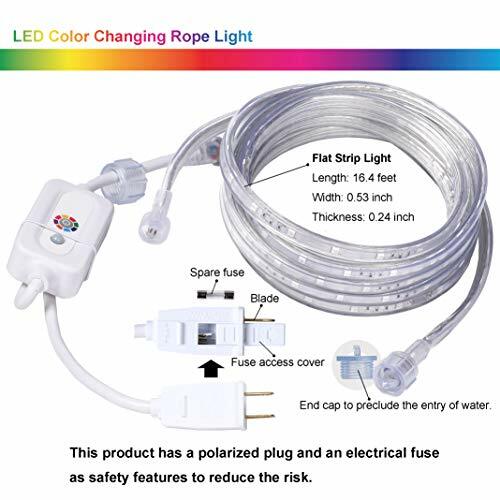 Mount it anywhere you want to décor, just plug in and enjoy this color changing rope lights. WORRY FREE TO USE IT FOR A LONG TIME. Our LED light strip is certified by the Electrical Testing Laboratories (ETL Listed) which gives more safety and reassuring. The plug contains an electrical 8-amp fuse as a safety feature. This rope light has a long lifespan up to more than 5,000 hours. SATISFACTION GUARANTEED: 30-day money-back guarantee for any reason, 12-month limited warranty for manufacturer defect, lifetime tech support. Any question, please don't hesitate to contact us via arefulteam@gmail.com, our customer service team would be more than happy to assist you fix the issue.